This software implements five state of the art algorithms aimed to enhance the quality of underwater images. It’s capable to automatically process a set of images within a directory, with all algorithms or just a subset of them. The Image Enhancement Tool comes with a simple GUI and it can be executed on Windows 64 bit operating systems (Windows 10 recommended). Implementation realized by adapting the C code obtained from http://www.ipol.im/pub/art/2012/g-ace/. 1. Pascal Getreuer, Automatic Color Enhancement (ACE) and its Fast Implementation, Image Processing On Line, 2 (2012), pp. 266–277. Implementation provided by OpenCV library. 1. S.M. Pizer, E.P. Amburn, J.D. Austin, R. Cromartie, A. Geselowitz, T. Greer, B.M. ter Haar Romeny, J.B. Zimmerman, and K. Zuiderveld, “Adaptive Histogram Equalization and its Variations,” Computer Vision, Graphics and Image Processing, vol. 39, 1987, pp. 355-368. 2. K. Zuiderveld, “Contrast Limited Adaptive Histogram Equalization,” Chapter VIII.5, Graphics Gems IV. P.S. Heckbert (Eds. ), Cambridge, MA, Academic Press, 1994, pp. 474-485. Implementation realized by porting the MATLAB version of the algorithm. 1. Bianco, G., et al. 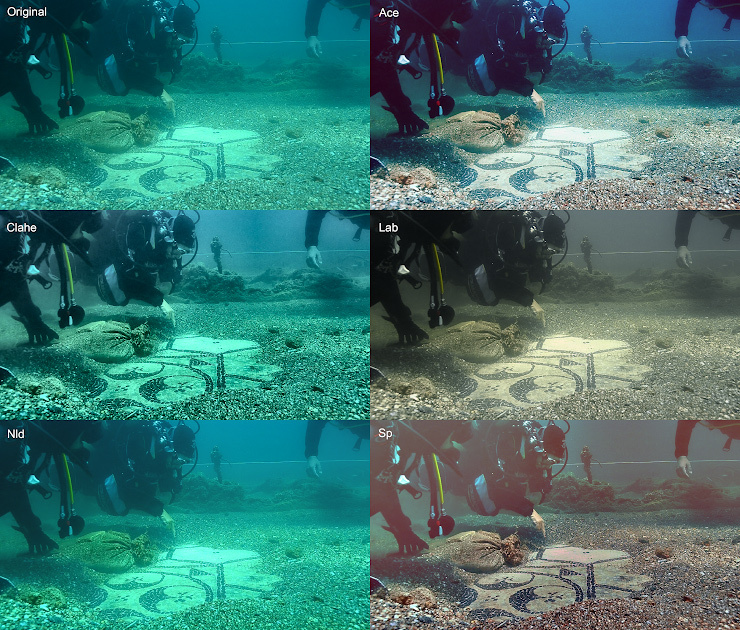 “A new color correction method for underwater imaging.” The International Archives of Photogrammetry, Remote Sensing and Spatial Information Sciences 40.5 (2015): 25. Implementation realized by porting the MATLAB code found at http://www.eng.tau.ac.il/~berman/NonLocalDehazing/. 1. Berman, Dana, and Shai Avidan. “Non-local image dehazing.” Proceedings of the IEEE conference on computer vision and pattern recognition. 2016. Implementation realized by adapting the C code obtained from http://www.ipol.im/pub/art/2014/84/. 1. Morel, Jean-Michel, Ana-Belen Petro, and Catalina Sbert. “Screened Poisson equation for image contrast enhancement.” Image Processing On Line 4 (2014): 16-29. After submitting the form you will receive an automated email with the download link. Your personal details will be used only for the statistics of the project. DISCLAIMER: THE SOFTWARE IS PROVIDED “AS IS”, WITHOUT WARRANTY OF ANY KIND, EXPRESS OR IMPLIED, INCLUDING BUT NOT LIMITED TO THE WARRANTIES OF MERCHANTABILITY, FITNESS FOR A PARTICULAR PURPOSE AND NONINFRINGEMENT. IN NO EVENT SHALL THE AUTHORS OR COPYRIGHT HOLDERS BE LIABLE FOR ANY CLAIM, DAMAGES OR OTHER LIABILITY, WHETHER IN AN ACTION OF CONTRACT, TORT OR OTHERWISE, ARISING FROM, OUT OF OR IN CONNECTION WITH THE SOFTWARE OR THE USE OR OTHER DEALINGS IN THE SOFTWARE. 2016, D. Skarlatos, P. Agrafiotis, T. Balogh, F. Bruno, F. Castro, B. Davidde Petriaggi, S. Demesticha, A. Doulamis, P. Drap, A. Georgopoulos, F. Kikillos, P. Kyriakidis, F. Liarokapis, C. Poullis, S. Rizvic, 2016. Project iMARECULTURE: Advanced VR, iMmersive serious games and Augmented REality as tools to raise awareness and access to European underwater CULTURal heritagE. International Conference on Cultural Heritage, Nov. 1-5, Nicosia. EuroMed 2016, 8th international conference. Lecture Notes for Computer Science – LNCS, SPRINGER VERLAG. Mangeruga, M., Cozza, M., & Bruno, F. (2018). Evaluation of Underwater Image Enhancement Algorithms under Different Environmental Conditions. Journal of Marine Science and Engineering, 6(1), 10. Mangeruga, M., Bruno, F., Cozza, M., Agrafiotis, P., & Skarlatos, D. (2018). Guidelines for Underwater Image Enhancement Based on Benchmarking of Different Methods. Remote Sensing, 10(10), 1652.